This October get ready to beat the winter freeze at the Kirkharle Lake and Courtyard Autumn Food and Craft Fayre weekend on 26th, 27th and 28h October, from 10am to 4.30pm each day (4pm Sunday). 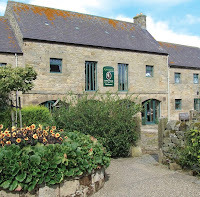 Now in its third year, the Kirkharle Autumn Fayre has more than 40 craft, gift and food stalls, a large marquee and on-site Kirkharle craft galleries and boutique shops. The event welcomed more than 4,000 people last year and is all set to welcome more this year. Kitty Anderson, project co-ordinator at Kirkharle, explains: "This year Kirkharle Lake and Courtyard will be transformed for our best ever Autumn Fayre weekend and we're ready to beat the winter freeze. "The Fayre brings together stallholders of quality and craftsmanship. With an array of original gifts for everyone, visitors will have the cream of the crop for their Christmas list gifts, and find inspired gift ideas and indulge in tasty traditional treats from the food stalls." Kirkharle Lake and Courtyard is the historic 18th Century courtyard and birthplace of 'Capability' Brown, known as the Shakespeare of gardening. Kitty continues: "With outstanding exhibitors from all over the region, as well as Scotland and Carlisle, we have a welcoming heated marquee, and free parking and entry for all." "With offers at Kirkharle's galleries and boutique shops, everyone is welcome and it's also a chance to support some of the region's most talented craftspeople, there's a hoard of heavenly gifts." Exhibitors are from Northumberland, Durham, Cumbria and Scotland. There are dozens of locally sourced Northumberland food producers offering an enormous selection of seasonal food and drink from around the region. Whether it's a sit down meal in the restaurant, a quick snack, a bite on the move or festive drinks, with family or friends  Kirkharle's winter wonderland has something for everyone.